Average insurance rates for a 2006 Honda Accord are $1,022 a year including full coverage. Comprehensive insurance costs around $158, collision insurance costs $228, and liability costs $478. Buying a liability-only policy costs as little as $526 a year, and high-risk insurance costs $2,210 or more. Teen drivers receive the highest rates at up to $4,142 a year. Rate data is compiled from all 50 U.S. states and averaged for all 2006 Honda Accord models. Rates are based on a 40-year-old male driver, $500 comprehensive and collision deductibles, and a clean driving record. Remaining premium consists of UM/UIM coverage, Medical/PIP, and policy fees. For a middle-aged driver, prices range range from as low as $526 for the bare minimum liability coverage to a much higher rate of $2,210 for a high risk driver. These differences highlight why anyone shopping for car insurance should compare rates for a specific zip code and risk profile, instead of making a decision based on price averages. Nobody likes having to buy insurance, particularly when their premiums are too high. Since consumers have many different company options, it can be challenging to find the lowest price company. It’s a great practice to compare rates on a regular basis because rates are usually higher with each renewal. If you had the lowest rates for Accord coverage a few years ago you can probably find a better price now. There is a lot of wrong information about insurance on the internet, so with this article, you’re going to get some great ways to stop overpaying for insurance. Finding cheaper protection is simple if you know the tricks. If you have a policy now or need a new policy, you can use these techniques to reduce the price you pay and still get good coverage. Vehicle owners only need an understanding of the proper way to compare prices online. The cost of insuring your cars can be expensive, but you can get discounts to reduce the price significantly. Certain discounts will be applied when you quote, but a few need to be manually applied before you get the savings. If you don’t get every credit available, you are paying more than you should be. New Vehicle Savings – Adding a new car to your policy is cheaper because new vehicles have to meet stringent safety requirements. Federal Government Employee – Simply working for the federal government may qualify you for a discount for Accord coverage with certain companies. Passive Restraints and Air Bags – Vehicles equipped with air bags may earn rate discounts of up to 25% or more. One Accident Forgiven – A few companies allow you one accident before raising your premiums if you are claim-free for a particular time prior to the accident. Payment Method – If you pay your entire premium ahead of time instead of monthly or quarterly installments you can actually save on your bill. Discounts for Safe Drivers – Safe drivers can get discounts for up to 45% lower rates for Accord coverage than less cautious drivers. It’s important to understand that most credits do not apply to your bottom line cost. Some only apply to individual premiums such as collision or personal injury protection. So despite the fact that it appears adding up those discounts means a free policy, it doesn’t quite work that way. Any qualifying discounts will bring down your overall premium however. To see a list of insurers offering car insurance discounts, click here to view. Comparing car insurance rates can be exhausting if you don’t understand the most efficient way. You can spend your afternoon driving to local insurance agents in your area, or you could use online quoting to achieve your goal. Many insurance companies are enrolled in a marketplace where insurance shoppers enter their policy data once, and each company can provide price quotes based on that data. This prevents consumers from doing repetitive form submissions for each company. To enter your information into the quoting system, click here to start a free quote. The single downside to comparing rates this way is that consumers can’t choose which insurance companies to get quotes from. So if you prefer to pick from a list of companies to request quotes from, we have a listing of car insurance companies in your area. Click to view list. Whichever method you choose, make darn sure you compare exactly the same coverages on every quote. If you are comparing different limits and deductibles on each one it will be very difficult to decipher which rate is best. When it comes to buying proper insurance coverage for your vehicles, there is no best way to insure your cars. Everyone’s needs are different so your insurance needs to address that. These are some specific questions can aid in determining whether your personal situation will benefit from professional help. 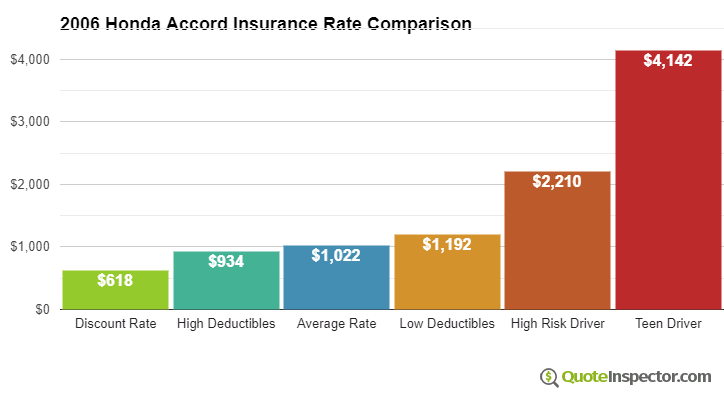 How high should deductibles be on a 2006 Honda Accord? What happens if I owe more than my 2006 Honda Accord is worth? If you’re not sure about those questions but a few of them apply, you may need to chat with a licensed agent. If you want to speak to an agent in your area, take a second and complete this form or you can also visit this page to select a carrier It only takes a few minutes and can help protect your family. Understanding the coverages of your policy can be of help when determining the right coverages at the best deductibles and correct limits. The coverage terms in a policy can be ambiguous and nobody wants to actually read their policy. Below you’ll find the normal coverages offered by insurance companies. Collision coverage pays to fix your vehicle from damage resulting from colliding with a stationary object or other vehicle. You will need to pay your deductible then the remaining damage will be paid by your insurance company. Collision coverage protects against things like sustaining damage from a pot hole, damaging your car on a curb and backing into a parked car. Collision is rather expensive coverage, so consider removing coverage from vehicles that are 8 years or older. Drivers also have the option to bump up the deductible to save money on collision insurance. This protects you and your vehicle’s occupants when other motorists are uninsured or don’t have enough coverage. Covered claims include injuries to you and your family and damage to your Honda Accord. Since many drivers only carry the minimum required liability limits, it only takes a small accident to exceed their coverage. That’s why carrying high Uninsured/Underinsured Motorist coverage is a good idea. Frequently the UM/UIM limits are similar to your liability insurance amounts. This can cover damage that occurs to other’s property or people. Liability coverage has three limits: bodily injury for each person, bodily injury for the entire accident, and a limit for property damage. As an example, you may have liability limits of 50/100/50 that translate to a $50,000 limit per person for injuries, a per accident bodily injury limit of $100,000, and a total limit of $50,000 for damage to vehicles and property. Some companies may use a combined limit which provides one coverage limit rather than limiting it on a per person basis. Liability can pay for things like legal defense fees, repair costs for stationary objects and attorney fees. How much liability coverage do you need? That is your choice, but it’s cheap coverage so purchase higher limits if possible. Comprehensive insurance coverage will pay to fix damage that is not covered by collision coverage. You first have to pay a deductible and then insurance will cover the rest of the damage. Comprehensive can pay for claims such as theft, hail damage, a broken windshield, hitting a deer and rock chips in glass. The most you’ll receive from a claim is the ACV or actual cash value, so if the vehicle is not worth much consider dropping full coverage. Cost effective 2006 Honda Accord insurance is attainable from both online companies and also from your neighborhood agents, and you need to comparison shop both so you have a total pricing picture. Some companies may not provide online quoting and most of the time these small, regional companies sell through independent agents. As you shop your coverage around, it’s a bad idea to buy poor coverage just to save money. In many instances, someone dropped physical damage coverage and learned later that their decision to reduce coverage ended up costing them more. The aim is to buy the best coverage you can find for the lowest price while not skimping on critical coverages.